Visit any college campus anywhere in America and you'll see dozens of Honda Civics everywhere you turn. The Civic has long been a favorite choice for teen and college drivers thanks to its reliable performance and overall affordability. Not only does the Civic have a reasonable price tag, but it also gets great fuel efficiency and requires fewer repairs than other models, on average. The modest price tag and profile of the Honda Civic makes it a great entry-level vehicle, but its updated features and comfortable ride also make it an excellent choice for everyone from young professionals to retirees. The Civic is a versatile vehicle that has much to offer to just about every segment of the car-buying market. The 2015 Honda Civic continues to deliver the reliable performance for which it is known while also updating some of the interior styling and convenience features. 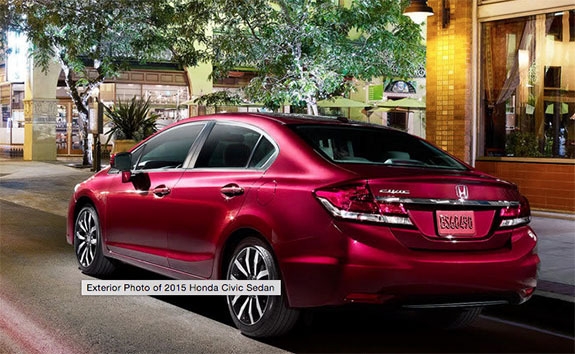 For a car that balances safety and dependability with style and affordability, you can't beat the 2015 Honda Civic. No matter who's driving the 2015 Honda Civic, everyone can agree that the ride is quiet, smooth and consistent. The base 1.8-liter four-cylinder engine puts out 143 horsepower and 129 pounds per feet of torque. Optional engine upgrades include a 2.4-liter Inline 4 engine with 205 horsepower and a 1.5-liter Inline 4 engine with an electric motor that puts out 110 horsepower. The engines are paired with a continuously variable automatic transmission or a manual transmission. When you drive the 2015 Honda Civic, you'll feel that shifting into the next gear is effortless, and you'll hardly hear the engine even when it's climbing up hill. You won't feel (or hear) the roar of the engine and you won't be able to amble over mountains, but you will feel confident as you drive around town, knowing that you have enough power under the hood to handle most driving situations that you'll encounter in your daily routine. The drive train offers excellent fuel efficiency. The 2015 Honda Civic gets 30 mpg in the city and 39 mpg on the highway. The hybrid engine offers a combined fuel efficiency of up to 45 mpg. With the 2015 Honda Civic, you won't be able to perform in weekend races or drive through mountain creeks, but you will be able to count on the Civic to offer you a reliable ride while you're driving to work or taking the kids to soccer practice, all while saving you money on gas. The Civic is like the best friend that you count on when you need to talk about your problems with your boss, not the one you call when you want a wild weekend out. The 2015 Honda Civic isn't just a practical vehicle that you drive because it's the safe and affordable choice. The Civic also delivers plenty of convenience features that make your ride a fun one. The entry-level LX model has features like a tilt and telescopic steering wheel, full power accessories, Bluetooth connectivity, auxiliary jacks and more. There is an Infotainment system with a five-inch full-color touch screen display that can play Pandora radio, make hands-free calls, and more. Audio and cruise controls are mounted right on the steering wheel for your convenience. Safety features abound in the 2015 Honda Civic. A rearview camera is included on the Infotainment display. Mechanical safety features include four-wheel anti-lock brakes, traction and stability control, tire pressure monitoring, emergency braking assist, and an engine immobilizer. Inside, the Civic includes front and rear head airbags, dual side-mounted airbags in the front, head rests in the front and rear, child safety locks and child seat anchors. The 2015 Honda Civic has performed well on safety tests. The National Highway Traffic Safety Administration has awarded it four and five stars on all crash safety tests, and the Insurance Institute for Highway Safety gave it a "Good" rating on all but two tests. Whether you are driving the 2015 Honda Civic yourself, or you have gifted it to your novice teen driver, you can feel confident knowing that it will provide extra protection on the road. The 2015 Honda Civic comes as either a sedan or a coupe, and it offers several trim levels and options packages so that you can get exactly what you need. Each model offers the same reliable performance, fuel efficiency and low price tag. The LX is the base model and includes everything that has been referenced above. The SE is the next level up, and it adds features like LaneWatch side-view monitoring, a more advanced audio system, 15-inch aluminum alloy wheels and automatic climate control. It also includes the HondaLink system for smart phone integration, allowing you to use voice commands for making hands-free calls or controlling Internet radio. With the EX trim level, you get a power moon roof, push-button start, keyless entry, a folding rear seat, automatic head lights, rear disc brakes (instead of drums) and 16-inch wheels. The EX model also gets an upgraded audio system with seven speakers and a larger 7-inch screen for the Infotainment system. The system includes an HDMI interface. The premium trim level is the EX-L, and it includes features like fog lights, automatic head lights, leather upholstery, a leather-wrapped steering wheel, heated mirrors, heated front seats, and an eight-way adjustable driver's seat. The infotainment system is updated with navigation, HD radio and satellite radio. The Civic Hybrid also offers a few unique features, such as the Forward Collision Warning alert system, low-rolling-resistance tires and a rear spoiler. The design also includes features to reduce drag, such as aerodynamic wheels and underbody panels. 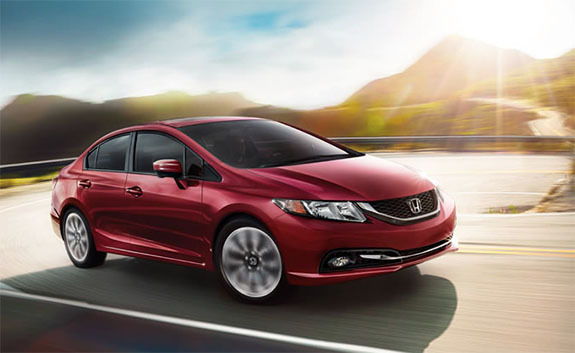 The base model 2015 Honda Civic starts at $18,490, which puts it in budget for most families. Even the premium EX-L model is affordable at $22,840. The 2015 Honda Civic is a great buy that will actually save you money in the long run thanks to its fuel efficiency and its reputation for needing fewer repairs over the life of the vehicle.